Literature and a love of the English countryside are natural companions. Walking the Literary Landscape brings the two together in a collection of 20 circular routes in the north of England, all between 3 and 9 miles (5 and 15 kilometres) in length. 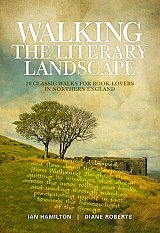 The walks explore the physical settings that inspired some of our greatest literature. Walk in the footsteps of writers like Arthur Ransome, who drew inspiration from the Lake District for his classic children's adventure Swallows and Amazons, or the Bronte sisters whose love of the moors around Haworth echoes through the centuries. See Chatsworth, the Peak District house that thrilled Jane Austen, and tread carefully in Whitby, the Yorkshire seaside town where Bram Stoker set his most famous creation Dracula. Each route introduces you to a landscape familiar to some of our greatest writers, and is accompanied by clear and easy-to-use Ordnance Survey 1:25,000 maps, straightforward directions, and information on each area's literary links, refreshment stops and local amenities. Everything you need for a great literary walk. Diane Roberts started serious walking while at university in Scotland and today combines her love of the outdoors with a passion for photography. She has an affinity for the landscapes that inspired our greatest writers - and the teashops that often spring up in their wake. Diane works for the civil service in Manchester and was previously part of the team that helped to bring the BBC to her native Salford. She lives with her partner Dave and their Italian greyhound Reggie. Ian Hamilton is a former journalist who worked on a number of local newspapers in Yorkshire and Lancashire. He peaked as a long distance walker at the age of 13 when he completed the Lyke Wake Walk in daylight hours, a feat he seems unlikely to repeat. Today he prefers shorter, less demanding expeditions, and is among the growing band of people who would like to keep the delights of the Trough of Bowland secret from the rest of the world. Ian is married to Ann and has three grown-up children.